You know you’ve made it when the fact your debut album actually leaves the charts makes news. That’s what happened to Emeli Sandé whose Our Version of Events topped the pile for seven non-consecutive weeks and spent most of 2012 riding so high it was small wonder it became the top selling disc of the year spawning single smashes in the shape of 'Next to Me' and 'My Kind of Love'. 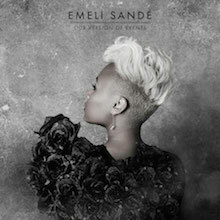 Emeli’s preeminence also means she repeated that feat with her earlier collaborative work – 'Read All About It' with Professor Green and 'Beneath Your Beautiful', another hypnotic dance anthem that teamed her with Labrinth. The girl of the moment appeared on the opening and closing ceremonies at the 2012 London Olympics and picked up the Brit Awards Critics’ Choice. Major tours lifted her easily into theatres and arenas and resulted in the fantastic Live at the Royal Albert Hall disc where she features all her best known work to date and adds the unreleased - so far - 'Enough and Pluto' as well as a cover of 'I Wish I Knew How It Would Feel To Be Free', a song made famous by Emeli’s idol Nina Simone on the 1967 album Silk & Soul. This girl has got immaculate taste. Emeli Sandé first came to prominence as the voice on Chipmunk’s debut disc I Am Chipmunk (2007) working closely with producer Naughty Boy (Shahid Khan) who then put her in the studio with Wiley. Long before this the Sunderland born daughter of a Zambian father and English mother was combining a tentative career as a songwriter with studies in medicine at the University of Glasgow. She wrote her first songs when she was eleven and after seeing Alicia Keys perform decided this was to be her life. Dedicated to her craft Emeli’s liaison with Naughty Boy convinced her to give up medicine; a bold step but one that emphasises her rounded character. They wrote high class tracks for the likes of Cheryl Cole, Tinie Tempah, Alesha Dixon and Professor Green and word began to spread: here at last was someone with technical expertise who also happened to be a terrific singer and pianist and could offer a striking performance when given the chance. Her solo career took shape in 2011 with the first release from Our Version of Events, the melodically rich 'Heaven'. The follow-up song 'Daddy' was even more striking with its peals of church bells, startling lyrics and huge chorus heralding the arrival of a truly dramatic star. Our Version of Events charmed everyone who came into its orbit. A seductive mélange of R&B grooves, classic pop hooks and elegant vocal delivery, it had critics frothing as they compared this new talent (to the public) to Lauryn Hill, Joni Mitchell and Tracey Chapman. Meanwhile fans emerged in high places with both Madonna and President Barack Obama expressing interest in her songs, with Madge paying special attention to the track 'Next To Me'. Fulfilling a desire to bring poetic themes back into popular song, Emeli delivered just that on the likes of 'Where I Sleep', 'Clown' and 'Read All About It, Pt. III', which she performed at the Olympics with such passion that the track became an iTunes sensation overnight, further boosting sales of the parent album. And so to Live at the Royal Albert Hall – over 90 minutes of Sandé bliss and a tour de force in terms of wow factor, slinky R&B and pop soul. Both a document of a really special event and an important signpost to Emeli’s future we point you towards some stand out cuts like 'Wonder' that is being used as part of the aural backdrop to Sky’s Ashes cricket coverage, and the beats and gospel of 'Next to Me' where love, faith and music itself are celebrated. Assisted by a stellar cast of players, special guests Labyrinth and Professor Green and three immaculate backing singers this concert album reveals a newcomer who is at the very top of her game. A refreshing, groundbreaking, orchestrated triumph this disc is destined for classic status – the version of 'Suitcase' for example is as tear-jerking, emotive and succinct as anything in Emeli’s own repertoire and stands proudly next to idols like Simone and Mitchell. That’s how good she is. Discover it now and accept that resistance is foolhardy. A totally transcendental experience from beginning to end, beautifully packaged and produced this is an album fit to grace any collection and is bound to give endless pleasure for years to come. In 2012, Brit's Critic Choice Award, a best new artist prize for the United Kingdom's best talent, unsurprisingly went to Emeli Sandé, a woman being lauded for her crystalline voice and her immaculate songwriting skills. By the time her debut album, Our Version of Events, hit shelves, Sandé had already been a number one-selling singer and songwriter, and had her work covered by names such as Tinchy Stryder, Alesha Dixon, and Susan Boyle. Many call the 24-year old starlet a jack-of-all-trades, and after listening to her first full-length debut, it's easy to understand why. Events skip from genre to genre breezily, often being carried by Sandé's piercing voice. Sonically, the album sounds like a whisked-blend of Leona Lewis, Kate Bush, and Alicia Keys -- but, somehow, Sandé still establishes her own style between the airy coos, sultry piano melodies, and sprinkling of xylophones, synths, and bells. Sandé's strongest tracks are such a mixed-bag -- the Professor Green-spinoff "Read All About It (Part III)" is a raw interpretation of the massive pop single, "Lifetime" is a midtempo love song that's as engaging as a close listen as it is late at night, and the electrifying first single "Heaven" has all the makings of a vibrant dance record slicked up for the floor. A true feature of this album is the sheer quality of the compositions, which, for lack of a better term, are unexpectedly sophisticated and nuanced for a mainstream record. What holds the album back in parts is the fact that its tempo is too slow at times, however, Sandé makes up for it with passion and precision. Our Version of Events is an earnest collection of works by a woman who is as good a composer as she is vocalist, a lethal combination in today's pop music business. In this case, the Critic's Choice Award was well deserved. 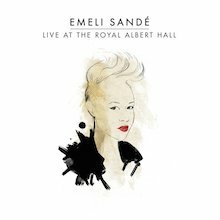 After little more than a year after the release of her debut, Our Version of Events -- a multi-platinum album in her native U.K. -- Emeli Sande released her first live album, recorded at London's Royal Albert Hall on a night in November 2012. It features performances of several songs from Events, as well as two songs ("Enough" and "Pluto") slated to be part of her second studio album. In addition, the artist pays tribute to one of her idols, Nina Simone, with a rendition of " I Wish I Knew How It Would Feel to Be Free."